Much has been written about Roma, its monuments and museums, its fountains and villas, its history and people. Many volumes would be needed to tell even a small part of its history, art and architecture, or to hint at what can be seen here, including Michelangelo's Last Judgement in the Sistine Chapel, the Vatican Museums, St. Peters's, the Roman Forum, the Colosseum, the Pincio, the Trevi Fountain, the Pantheon... Everything to be said about this city has probably been said before. 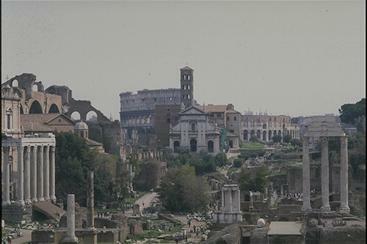 However, Roma cannot be described completely; it needs to be experienced in person. It is impossible to be bored in Roma. 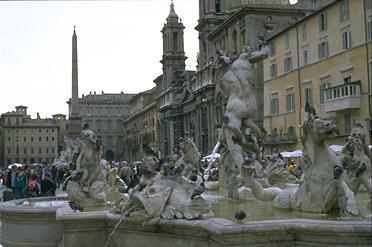 Besides its churches, monuments,and museums, Roma has more to offer: classical music, theater and ballet, jazz, sport, pubs, and all kinds of shops and elegant boutiques. Roma is easily reachable from every part of the world, having two international airports and an international train station. Moreover, all infrastructure and public transportation networks were greatly improved for the Jubilee year 2000. September is one of the best periods to visit Roma. It is generally warm and sunny. Temperatures may reach 25°C (77°F) during the day but are cooler in the evening. "Leonardo da Vinci" intercontinental airport, located in Fiumicino, is Europe's fourth largest in terms of number of passengers and provides travellers with the most modern services and facilities. The centre of Roma can be easily reached from the airport by bus, train or taxi. Non-stop trains leave every 60 minutes and during rush hours every 30 minutes. Trains leave every 20 minutes during the weekdays and Saturdays and every 60 minutes on Sundays, making stops in different areas of the city. Taxis and limousines are available at the international arrivals area. Rome is at the heart of the Italian railway network. Excellent Intercity service from Termini Railway Station links Rome to every major city in Europe. Italy has 6,400 km of modern motorways, which reach all regions of the country. Rome can easily be reached by car from the "Autostrada del Sole - A1", the longest Italian motorway running along the peninsula from north to south. Numerous bus lines connect all areas of the city, including the area of the Conference. The underground ("Metro") has two lines, Linea "A" (red) and Linea "B" (blue). These intersect at Termini so you have to pass through Termini when you need to switch line. Tickets are valid for 75 minutes of travel and can be used for one underground journey and unlimited bus travel. They can be purchased at tobacco shops ("Tabacchi"), bars, news stands and machines in stations. The driver does not sell tickets. Daily and weekly tickets are also available. The streets of the historic centre of Roma - the famous Spanish Steps, Via Condotti, Via Frattina, Via della Croce, Via Borgognona and, of course, Via Veneto - boast the workshops of Italy's foremost and world renowned fashion creators along with glamorous shops, all bearing the unmistakable mark "Made in Italy". Via Margutta and Via del Babbuino abound with privately owned artists' studios and restoration workshops. Galleries can be found almost everywhere along the side streets, such as Via dei Coronari, one of the most picturesque streets in Roma, which also hosts numerous antique dealers. Shops are usually open from Monday to Saturday, from 9:00 to 13:00 and from 16:00 to 19:30. However, several shops in the center are open from 10:00 to 19:00. Most shops are closed on Sunday and Monday morning.